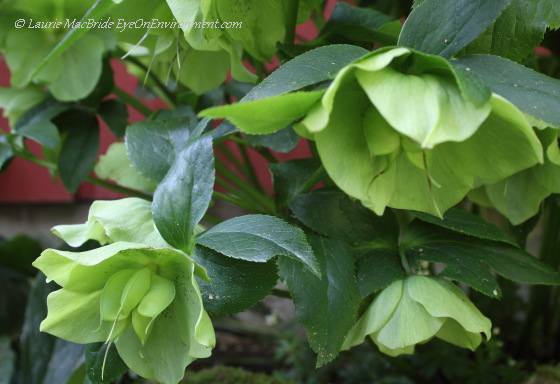 Hellebores are classed as poisonous, but the deer didn’t seem to suffer at all from their meal. 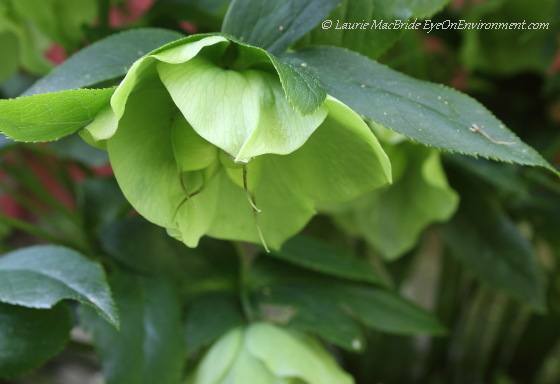 I wasn’t so sure the hellebores would survive, though – let alone flower this year! But flower they did, and then some, starting very early this spring. 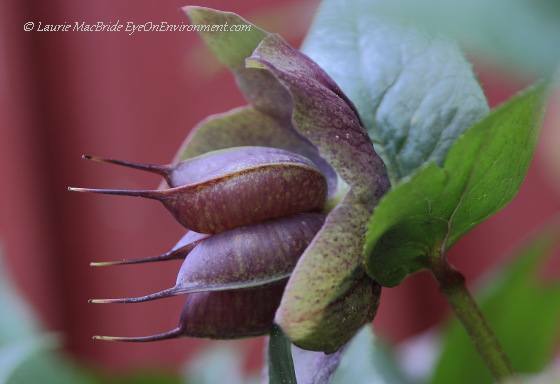 By the time I got around to taking my photos, their flowers were quite mature – you can see how large their carpels (ovaries) have become, swelling up as the seeds form inside them. The flowers will remain through most of the summer, although their colours will fade and they’ll take on a different look as they drop their seeds. Their dark green, glossy foliage should be impressive for months as well (unless the deer go at them again, that is) . 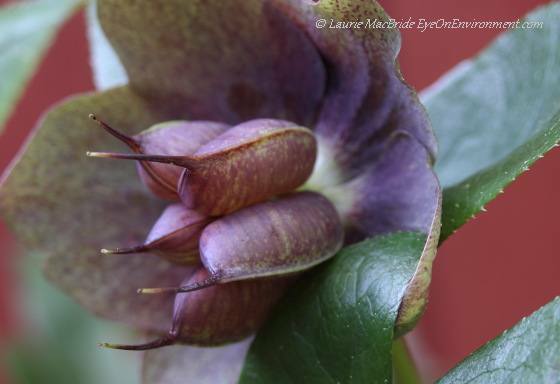 Our abundance of hellebore flowers stems from just two plants: a “Lenten Rose” (Helleborus orientalis), with purple flowers fading to chocolatey-mauve as they mature, and a “Christmas Rose” (Helleborus niger), with almost-white flowers that take on a greenish tone as the season progresses. Over the years the two plants’ footprints have expanded, growing more and more stems, so when they’re in flower, hellebores look to be positively bursting out of the bed. For a shady spot on the edge of a forest, you couldn’t ask for a more perfect plant. 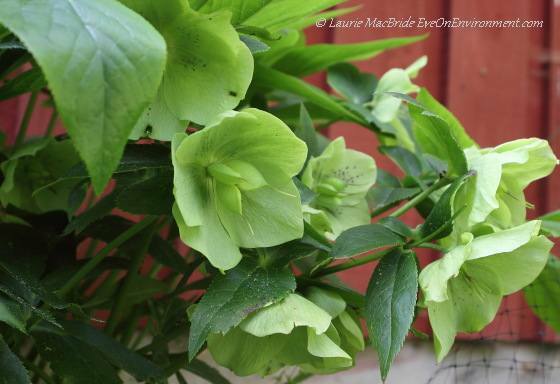 Hellebores are hardy perennials that seem to thrive on neglect, and slugs don’t bother them (an important virtue, as we have legions of slugs at our place). Just don’t be fooled into believing that they’re “deer resistent”! Click on any image in the gallery below to view in larger, carousel format. 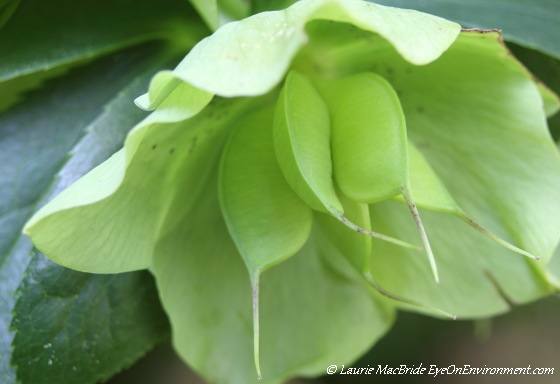 Posted by Laurie MacBride, Eye on Environment on May 16, 2012 in Garden and tagged Christmas Rose, deer, flowers, gardening, hellebores, Lenten Rose, nature, photos, plants, spring, woodland gardens.